(CNS): The Smokeless Tobacco Association, the All India Kattha Factories Association and the Central Arecanut and Cocoa Marketing and Processing Co-operative Ltd have suddenly assumed the responsibility to inform people about the relative merits of gutkha over cigarettes. Their bold and blatant advertisement splashed in prominent newspapers is part of a country-wide campaign in an apparent retaliation to the ban on gutkha (tobacco laced pan masala), currently effective in 14 states of India. 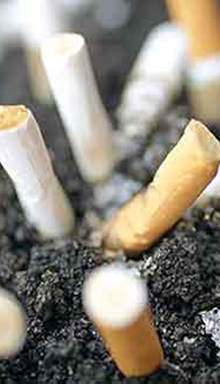 It wickedly accuses the 14 states of treating cigarettes to be beneficial for health and. The advertisement questions if it is just and fair to ban gutkha and not cigarettes, and reads that:—(i) one pouch of gutkha contains 0.2gm of tobacco as opposed to 0.63gm of tobacco in one cigarette; (ii) cigarette has 4000 chemicals while smokeless tobacco has 3000 chemical; (iii) cigarette smoke affects the health of non-smokers while gutkha does not; (iv) ban on gutkha will render lakhs of shopkeepers and farmers without a livelihood. This Act has got nothing to do with the harmful effects of tobacco on health—it only disallows any nicotine/tobacco laced product to be sold under the banner of a food product. So if gutkha had not been sold as a food product, it would not come under the purview of this Act. All these years the gutkha manufacturers have reaped the benefits of enticing an ever increasing number of consumers to their nicotine laced products sold under the garb of mouth fresheners. But now when they are being asked to peddle poison in the name of poison alone, and not camouflaged as a dietary add on, they are feeling threatened. Like a wolf in sheep’s clothing they talk of the effect of this Act on the livelihood of thousands of people engaged in the industry, rather than help in creating other viable employment avenues for them. Also, they are happily forgetting about the havoc their products have been wreaking on millions of consumers and their families. As of now, this new regulation of FSSA seems to be too weak even when enforced properly, and already there is news of gutkha manufacturers having found out dubious means to circumvent it. Many brands in Delhi and elsewhere are selling pan masala and tobacco as a duo in two different pouches which can be mixed together and consumed. So it is unlikely that consumption of tobacco will go down in those already hooked on to gutkha. Neither are they likely to switch over to cigarettes. It seems that they would continue enjoying their daily dose, albeit with a slight change in the consumption style. Of course, as the process of mixing two products (rather than have a readymade mixture) is a little more cumbersome, it might deter new young entrants and perhaps female consumers—some relief indeed. To reduce the number of tobacco users it is imperative to take steps to deter neophytes from joining the bandwagon of tobacco users and also to help the current addicts to quit, rather than encouraging them to switch over from one lethal from of tobacco to another. What we essentially need are quality tobacco cessation clinics to be integrated within the existing healthcare setup by training the healthcare professionals to provide cessation facilities.